Sergey V. Petoukhov. Dr. Phys.-Math. Sci, Grand Ph.D., Full Professor, Laureate of the State prize of the USSR, academician. Chief of the Laboratory of biomechanical systems of the Mechanical Engineering Research Institute of the Russian Academy of Sciences, Moscow. 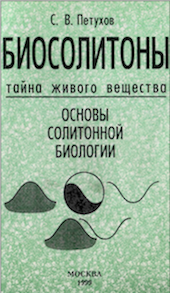 1964-970- a student of Moscow Physical-Technical Institute, Department: Physics of Living Systems. 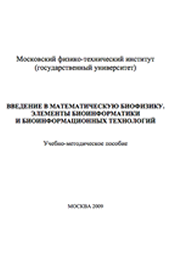 1970-1973 — postgraduate of Moscow Physical-Technical Institute. 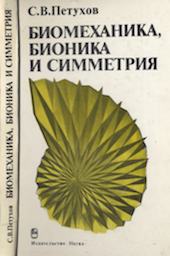 1973 — dissertation of candidate of biological sciences (in «biophysics» specialty). 1973 — till now — Mechanical Engineering Research Institute (Department of Biomechanics), Russian Academy of Sciences, now — Head of Biomechanical Systems Laboratory. 1988 — a foreign stager of the Technical University of Nova Scotia, Halifax, Canada. 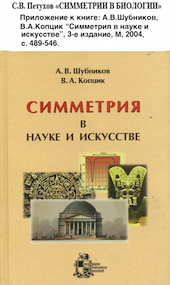 1989 — 2000 — Vice-President of the International society «ISIS-Symmetry» («International Society for the Interdisciplinary Study of Symmetry»). 2000 — till now — Director of Department of Biophysics and Chairman of Scientific-Technical Council in «Scientific-Technical Center of Information Technologies and Systems (INTES)». 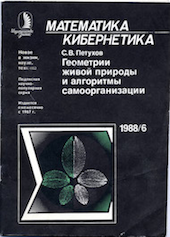 2000 — till now — Academician of Academy of Quality Problems (Russia). 2003 — till now — Chairman of International Advisory Board of «International Symmetry Association (ISA)» (its headquarters is at Budapest, Hungary, http://symmetry.hu/). 2003 — 2004 — Chairman of the International Program Committee of «International Conference on Bioinformatics and its Applications-2004» (December, 2004, Fort Lauderdale, Florida, USA). 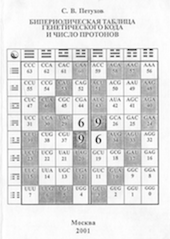 2008 – the bases of matrix analysis of molecular-genetic systems together with genetic Fibonacci-stage scales were described in his book “Matrix genetics, algebras of the genetic code, noise-immunity”, Moscow, 316 p. A video of the first concert of genetic music in these new musical scales (Vienna, Austria, 4 June 2015) is given at the website. 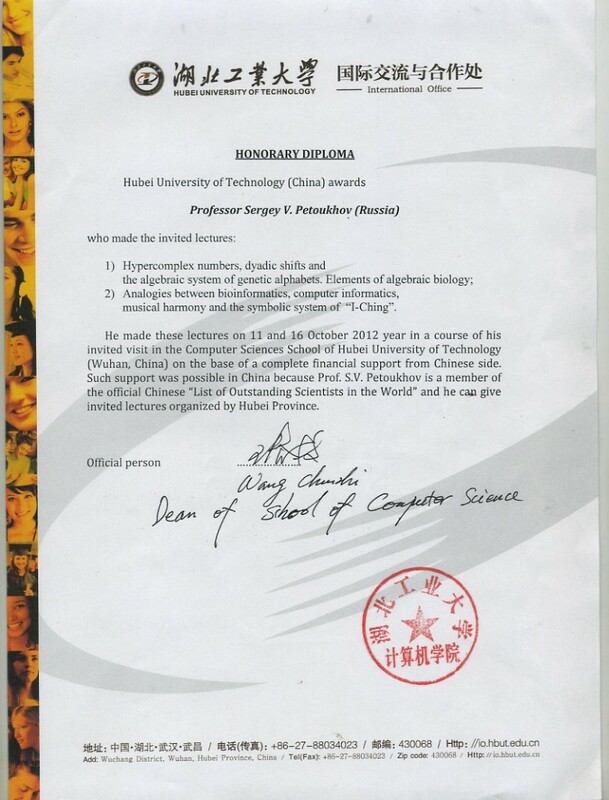 2012 – the “Honorable Diploma”, which S.V. Petoukhov was rewarded in China in connection with an inclusion of S.V.Petoukhov by the Chinese government in the official “List of Outstanding Scientists in the World” . 2014 – his conception of “resonant genetics” was formulated, which considers a living organism as a genetic system of resonances. 2017 – Vice-President of the International Society of Natural Medicine (ISNM)), Slovakia. 2017 – the internship at the Institute of Mathematical Biology of the Mannheim University of Applied Sciences (Germany) on the basis of a scholarship from the German Academic Exchange Service (DAAD). S.Petoukhov is a member of editorial boards of the international journals «Journal of Biological Systems» (World Scientific, New Jersey/London/Singapore/Beijing/…) and «Symmetry: Culture and Science» (ISF, published in Hungary). He is a guest editor of «Symmetry in Genetic Information», ISBN 963216 242 0, special double issue of the journal «Symmetry: Culture and Science», 2001, v.12, #3-4. 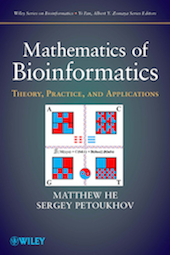 He is an editor (together with M.He and G.Narasimhan) of the book «Advances in Bioinformatics and its Applications», Series in Mathematical Biology and Medicine, v. 8, 2005, World Scientific. He is a guest editor of the issue «Symmetries in Genetic Information and Algebraic Biology» of the journal “Symmetry: Culture and Science”, v. 23, # 3-4, 2012. 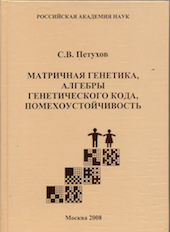 S.Petoukhov was one of the main organizers of a few International conferences: conferences and festivals on symmetries in science and culture (1989, Budapest, Hungary; 1992, Hiroshima, Japan; 1995, Washington, USA; 1998, Haifa, Israel; 2003, 2006 and 2009, Budapest, Hungary; 2013, Delft, Netherlands), the conference «Bioinformatics and its Applications” (2004, Fort Lauderdale, USA), symposium “Music. Mathematics. 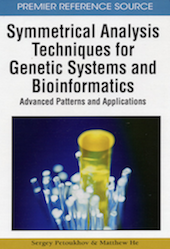 Science” (2013, Moscow, Russia), symposium “Symmetries in genetic information and algebraic biology” (2013, Delft, Netherlands), symposium «Symmetries in music» (2013, Delft, Netherlands), symposium “Theoretical approaches to bioinformation systems — TABIS 2013” (2013, Belgrad, Serbia), etc. He is the author of 7 books and approximately 200 other scientific works. He is a specialist in theoretical and mathematical biology (in particular, in problems of genetic codes and bioinformatics), biomechanics, crystallography, theories of symmetry and self-organization.